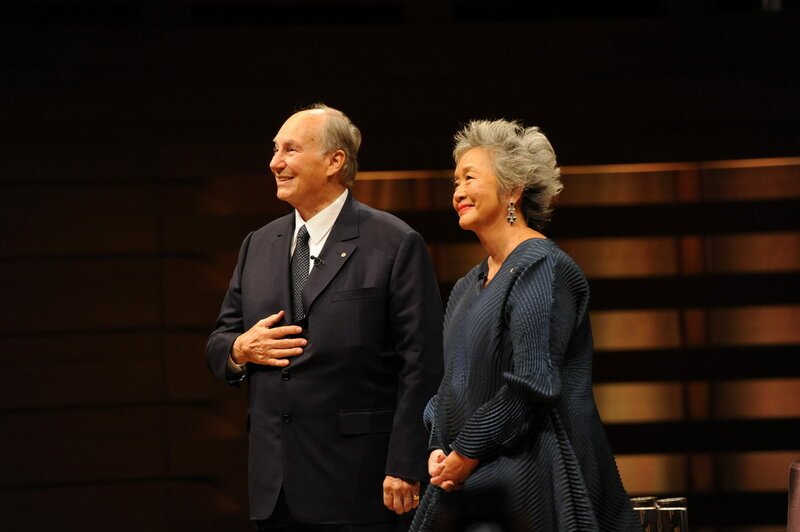 Toronto, Canada, 21 September 2016 - His Highness the Aga Khan, today received the inaugural Adrienne Clarkson Prize for Global Citizenship in a ceremony which concluded the three-day 6 Degrees Citizen Space conference, the new public initiative of the Institute for Canadian Citizenship. The award recognizes an individual whose life has demonstrated a steadfast commitment to the ideals of belonging and inclusion. Accepting the Prize in Toronto, the Aga Khan focused his remarks on the values of global citizenship and the spirit of pluralism on which it rests. He noted that embracing such values “should not mean compromising the bonds of local or national citizenship. The call of pluralism should ask us to respect our differences, but not to ignore them; to integrate diversity, not to depreciate diversity,” he remarked. The Aga Khan also reflected on the responsibility to improve quality of life in places around the world where it is unsatisfactory. A “healthy pluralistic ethic,” he suggested, can be instrumental in fighting poverty, improving health and education, and expanding opportunity. For more information about the Adrienne Clarkson Prize for Global Citizenship and 6 Degrees, please visit www.6degreesto.com. For more information on the Aga Khan Development Network, please visit http://www.akdn.org/. His Highness the Aga Khan, an honorary Canadian citizen and Companion of the Order of Canada, is the 49th hereditary imam of the Shia Ismaili Muslims and founder and chair of the Aga Khan Development Network (AKDN). The AKDN is active in 30 countries and employs approximately 80,000 people. Its non-denominational agencies are responsible for areas ranging from health and education to rural development, architecture, culture and economic sustainability. Through his work and the institutions he has established, the Aga Khan has emphasized the importance of pluralism in fostering global harmony. In Canada, initiatives include the Global Centre for Pluralism in partnership with the Government of Canada, the Aga Khan Museum in Toronto and Ismaili Centres in Vancouver and Toronto. Each of these serves, in various ways, as a platform for dialogue and education where understanding among one another is promoted and where bridges are built across cultures.